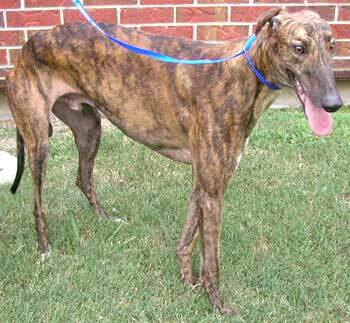 TallMan is an almost 2-year-old handsome dark brindle male, born November 2001. TallMan never raced as he could not finish school. His sire is Gable Dodge and his dam is Double Trouble. He is a sweet, loving and tall boy who needs a few pounds on him! It is not known at this time if TallMan is cat tolerant, but he is very dog friendly and small dog tolerant.